FILE - In this image released by the U.S. Department of Defense, U.S. Marines and sailors prepare to board a KC-130J Marine Super Hercules at Camp Lemonnier, Djibouti, Dec. 24, 2013. China is denying accusations that it fired military-grade lasers at U.S. planes landing at Camp Lemonnier, in the East African nation of Djibouti. At a news conference Thursday, Pentagon spokesperson Dana White said the U.S. is “confident” Chinese nationals are behind two recent incidents involving four-engine military transport planes making their landings. “They are very serious incidents. There have been two minor injuries. This activity poses a threat to our airmen,” White said. She added that the Pentagon had issued a formal complaint and asked China to conduct its own investigation. In its response, China did not explain why the U.S. claims are untrue or directly deny that they have employed lasers in Djibouti, where China recently opened a new logistics and military base. The U.S. believes the laser was beamed from or near China’s base, about 10.5 kilometers from Camp Lemonnier, the U.S. installation. Why China would attempt to injure U.S. pilots or possibly cause their aircraft to crash isn’t clear. Joshua Meservey, a senior policy analyst for Africa and the Middle East at The Heritage Foundation, suspects the attacks might be a test of some kind. “I think it’s probably just somewhat of a standard operating procedure, unfortunately, for the Chinese where they, if they see an opportunity to harass, or maybe they’re trying out — it could well be that they’re experimenting with lasers as a way of disrupting flights and they thought that the U.S. military flights in Djibouti were great guinea pigs,” Meservey said. Chinese military analysts who spoke to the South China Morning Post, a news organization based in Hong Kong, said the lasers may have been intended to disperse birds or intercept reconnaissance drones. Sim Tack is the chief military analyst with Force Analysis, which assesses armed conflicts around the globe. He recently said that China’s new base allows it to install communication, and possibly interception, systems that allow it to monitor what other powers are doing. “Having that military presence there and having some kind of local intelligence node, that’ll probably assist China in becoming a little more actively involved with its potential allies in that area,” Tack told VOA in November. “They have a very strong long-term strategy that they are following, and both that military diplomacy and the economic investments are key pillars of how they actually establish their presence in that region,” Tack said. FILE - Chinese People's Liberation Army personnel attend the opening ceremony of China's new military base in Djibouti, Aug. 1, 2017. 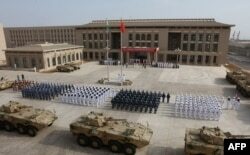 Marine General Thomas Waldhauser, who oversees U.S. troops in Africa, has expressed the value of cooperation with China. “Across the continent, we have shared interests in African stability. We see many areas where we can cooperate with the Chinese military. For example, we both support U.N. peacekeeping missions and training with African defense forces,” Waldhauser said in prepared remarks at the United States Institute for Peace last year. Despite recent flare-ups, including this past week’s events, Meservey voiced optimism that the U.S. and China can still cooperate in Djibouti, at least on a small scale. Ye Bing contributed to this report.